October has become the cruelest month for Charleston. Last month, Hurricane Matthew roared past the South Carolina coast, sending a 9-foot tide into the city and dumping heavy rainfall across the marshy low country. Abandoned cars stalled in downtown intersections where floodwaters lapped at their windows, and police blocked off dozens of streets. Yet the flooding of the historic City Market downtown — built on a long-ago filled creek bed — was surprisingly shallow. This was news — the iconic local tourist attraction had become known for the floods that overtook it in storms, so much so that kayakers would pose for memorable photos of their boat bobbing through the submerged streetscape. This time, the water had risen inches, not feet. A year before, in October 2015, Charleston survived more than 20 inches of rain over three days when Hurricane Joaquin swept past offshore. The City Market experienced minimal flooding that time too. Charleston is one of a growing number of coastal cities in red states adapting for climate change — and one that other low-elevation cities should be watching as they navigate the challenges of rising sea levels, record-shattering downpours and increased flooding risk. The system referred to by Cabiness is a $23.2 million stormwater drainage system invested in by the small Southern city (population 132,000) and it is part of a bigger strategy designed to prepare infrastructure for the hotter, wetter and more unpredictable climate of the future. Just two months before Matthew hit Charleston and devastated cities farther south across Florida, Haiti and the Caribbean, an intense storm sent floodwaters surging in low-lying parts of Louisiana. When the 2016 Atlantic hurricane season ends at the end of this month, it will go down in history as the most active since 2012, the National Oceanic and Atmospheric Administration (NOAA) has predicted. For southeastern cities like Charleston, the difficult season was just another reminder of the even more monumental challenges ahead. Despite its precarious coastal geography, the Charleston metropolitan region is growing fast. A population that is now 750,000 is expected to grow further over the next 12 years to hit 1 million, and housing is in high demand, especially along waterways that can swell and overflow in storms. As Charleston knows, protecting a single one of these neighborhoods from rising water will cost taxpayers tens of millions of dollars. Peer at the tidal gauge on Charleston Harbor and the increased flooding starts to make sense. Over the past century, sea level has risen about a foot. About half of that is caused by natural geological pressures. The other half is driven by global sea level rise, which has been accelerating since the 1990s. Meanwhile, as climate change accelerates, heavy downpours are expected to increase in number and intensity. In December 2015, two months after City Market’s averted disaster, Charleston adopted its first comprehensive plan for adapting to climate change, known as the “Sea Level Rise Strategy.” Its recommendations include improving stormwater drainage systems, building new seawalls and enhancing existing ones, enacting special building standards for flood hazards, steering or raising public facilities and infrastructure outside of hazard areas, acquiring wetlands and other open space, and writing ordinances to limit new development in flood-prone areas — a controversial proposition in pro-growth Charleston. The strategy is grounded in science showing that the city must plan for a 1.5-foot to 2.5-foot sea level increase over the next 50 years. Failure to meet this challenge would cost taxpayers $1.5 billion in “gross damages” and lost wages. Yet the document is only a start to a process that will require the city to tackle hard economic, cultural and political questions. As it stands now, the strategy provides no new priorities, commitments or funding for a city that sprawls more than 100 square miles beyond the peninsula that is its historic core. The phrase “climate change” is used only once in the 20-page document. “This is a guiding document, a framework, where the actual difficult work has not been broached yet,” says Katie Zimmerman, a program director with the Coastal Conservation League, a nonprofit organization that works with local planners and community activists on land use and climate issues. The strategy is not actually new in some respects. For decades, the city has been working on fixes to the chronic flooding, which has been a problem since Charleston’s founding. But what is new is the comprehensive approach, one that looks at all the fixes as part of a single long-term strategy. “Many of the stormwater [efforts] in the city’s strategy have already been heavily invested in,” including improvements to Market Street, says Elizabeth Fly, a Charleston-based scientist who specializes in coastal climate adaptation. Today, some $235 million in Charleston drainage projects are planned, under construction or complete. This figure does not include tens of millions of dollars for ongoing efforts to raise some of the peninsula’s seawalls. For most of its early history, the Charleston region faced devastating floods. In the spring, massive floods called “freshets” would barrel down the watersheds and inundate low country forests for weeks at a time. Eventually, South Carolina planters, who politically and economically dominated the low country and the state, used slave labor to drain and dike many flood-prone areas. The Civil War and its aftermath devastated Charleston’s economy, and the city remained an insular, impoverished backwater for generations. During World War II, however, U.S. naval investments in Charleston Harbor jump-started the port and local economy. In the 1980s and ’90s, Charleston experienced a spectacular boom driven by tourism. Homes and neighborhoods on the peninsula, particularly near waterfronts, were revitalized. Yet the city’s flood-proofing did not keep up with increasing sea level rise. Imagine the Charleston peninsula as an oval bowl with an irregular lip. Some stretches of the lip are much lower than others. Some waterfronts were elevated generations ago for storm surge protection, but others were elevated only modestly above the typical high tide of 5 to 6 feet. In the low country, each foot of flood protection can mean the difference between your home getting wet or staying dry. City engineers have raised the massive seawall called the High Battery, which protects the tip of the peninsula, to an elevation of five and half feet above a 7-foot king tide. Next, the city plans to rebuild the Lower Battery, which stretches for 5,000 feet along the peninsula’s southern waterfront. Engineers are discussing two options: Build up the Lower Battery now to account for another 2.5 feet of sea level rise, or shore up the decaying wooden foundations with concrete so the wall can be raised to that elevation later. At a cost of $48 million, mostly from the city’s existing accommodations tax, the Lower Battery project would take six to eight years to complete — and even if everything goes as planned, the wall is no protection for many sections of the city beyond its boundaries, including an affluent neighborhood called Harleston Village that borders the Ashley River. On a muggy night last summer, Cabiness, along with engineers working for the city, met with residents of Harleston Village. If you imagine the peninsula’s bowl again, much of Harleston Village sits along its largely unprotected southwestern lip. A thin line of rip-rap — large rocks — is the only barrier between the upper edge of Ashley River marsh and the neighborhood. In late October 2015, an extreme tide of 8.6 feet washed across its main state road and flooded homes — the third October flood in two years. Now engineers are exploring how to protect the waterfront with a seawall, a berm or even elevating existing roads. Gathered in a public library downtown, 20 residents peppered the city engineers with politely irritated questions about when their neighborhood would get the infrastructure needed to keep it dry. Stormwater backs up into streets even during ordinary high tides, and flooding blocks intersections during heavy downpours. Home to the College of Charleston, several public and private schools, plus a healthcare district that includes the Medical University of South Carolina and hospital facilities, the neighborhood was next on the city’s list to receive a stormwater system upgrade with added storage tunnels, pumps and stormwater outlets. Yet no one is quite sure where money for the $80 million to $100 million project will come from. Remley Campbell lives in one of the lowest-lying spots in Harleston Village, a few blocks from the river. Elevated on pilings, his home stayed dry during the early October 2015 flood. But trucks and SUVs powered through the flooded street, creating waves that pounded and dented his garage door. He is skeptical that improvements will happen anytime soon without a clear plan for financing them. “I’m 70 years old, and I don’t think I’ll see any improvement in my lifetime,” he says. Despite Campbell’s skepticism, these improvements have been long in the making. 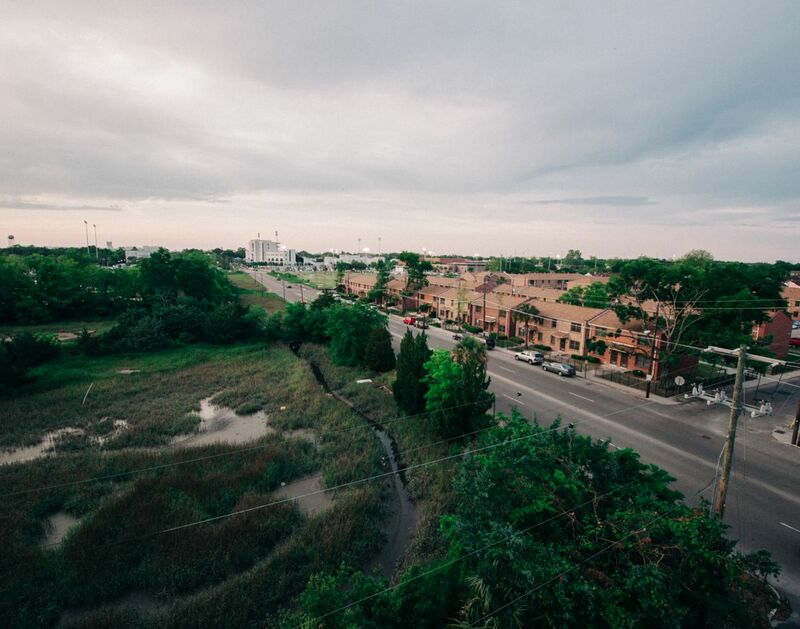 In 1984, the city of Charleston adopted its first master drainage plan, which was followed by the creation of funding streams for eight priority drainage projects, one of which was the Calhoun West/Beaufain effort. Later that decade, the city established a two-mill property assessment for stormwater, which was used to leverage a $9 million bond that supported the city’s completion of two major drainage projects. By the ’90s, the city realized that keeping the city dry was a big job that taxpayers couldn’t take on alone so in 1996, a stormwater utility fund was created. City officials began to leverage state and federal grants directed at solving its infrastructure challenge. In December 2015, weeks before leaving office after 10 terms and 40 years, then-Mayor Joseph P. Riley Jr. pushed through another two-mill tax assessment directed to drainage improvements. Cabiness says that the Calhoun West/Beaufain project in Harleston Village and nearby areas is moving forward just like those projects did; engineers will design a “shovel-ready” plan and consultants will write grants to acquire funding. “It’s significant that we have been able to leverage a lot of money from state and federal governments to help make these drainage projects happen,” Cabiness told the crowd at the library. The house where Campbell lives was, in the 1870s, the site of a mill pond for a lumber mill on the Ashley River. “They would dump the sawdust in there, and if you dig down, you get to a layer of it,” he says. Dig under other houses in the city and you find all sorts of other past lives. Roughly half of the peninsula sits on marshy fill — low, wetland areas that were claimed for public dumps and eventually topped off with dirt. For those in less affluent parts of Charleston, that history can create additional challenges. Just north of Harleston Village on the peninsula, streets bordering the Gadsden Green public housing project are inundated during king tides. “It comes right up to the second step,” says a Gadsden Green resident, sitting on her front stoop on Hagood Street. (She refuses to give her name. Other residents in that complex also refuse.) She points across the street. “All the trash that’s over there,” she says, “comes over here.” Across the street is a remnant tidal creek that was straightened into a drainage ditch for a municipal landfill capped in the early 1970s. Now, the landfill is eroding and seeping trash into the creek, which overflows during king tides and carries trash into the street. The city is working with developers to fix these drainage problems as part of a 60-acre redevelopment that will include apartments, a medical research center and commercial spaces, but leave public housing units untouched. The Charleston peninsula has always been the city’s center of power, prestige and wealth. In the post-World War II years, however, neighborhoods on the peninsula were becoming crowded, and new subdivisions sprung up on the mainland across the Ashley River. This sprawling area of single-family homes and strip malls, called West Ashley, is to the Charleston peninsula as Queens or the Long Island suburbs are to Manhattan. 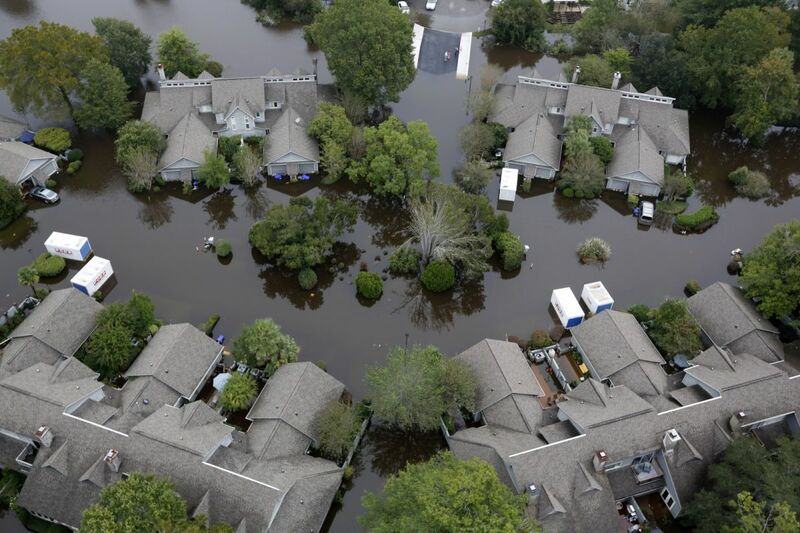 Starting in 1970s, West Ashley’s sprawl had stretched to flat, low-lying floodplains with poor drainage near Church Creek, a tributary of the Ashley River, where prosperous neighborhoods were hit hard by the October 2015 floods. In 2010, the city spent $3.7 million to divert stormwater from flooded areas to Church Creek. But some homes in the area were built at such low elevations that they will inevitably flood again someday. For homeowners, the question is whether to stay. The city has given the owners of 36 repetitive-flooding properties the option to relocate so the structures can be razed and land turned back into a natural floodplain, but there is no sure plan for how to reimburse the owners for the felled homes. In October, the city was denied a $10 million FEMA flood mitigation assistance grant that would have enabled the city to offer residents a fair-market price for their properties and other government aid to purchase homes on higher ground. The city has since submitted another application to FEMA and is waiting to hear back on another grant request that would be for about the same amount of money and could be used in the same way. Officials say a decision should be made by early 2017. For people like Ted Weager who lives in Bridge Pointe condominiums, which has flooded five times since 1987, and has tentatively agreed to a FEMA buyout, the decision will be bittersweet, however it comes down. “I’d live in my home happy-ever-after if it wasn’t for the flooding,” he says. Elizabeth Fly lives with her family in a split-level home in Heathwood Estates, an older West Ashley subdivision that isn’t considered part of a flood zone. But maps are not that precise and last October, Fly watched 18 inches of floodwater pour into in the lower level of her house, damaging two bedrooms, a bathroom, a laundry room and ductwork at a cost of $30,000. “The problem,” says Fly, “was that the ditches and drains were not maintained, and they were overwhelmed. The stormwater flow was flowing in the wrong direction,” coming backward into their home. The city recently regraded the pipes so they would function properly yet Fly knows problems remain, even if they won’t make themselves obvious until the next flood. Fly’s employer, the South Carolina Sea Grant Consortium, received a NOAA grant to study Charleston-area infrastructure and its capacity to withstand nuisance flooding and storm surges. The Consortium is managing the grant on behalf of the Charleston Resilience Network, a collaboration of local, regional, and state governmental leaders, public and private utilities, and research institutions. In other words, Fly is working with the Charleston Resilience Network to build tools and provide hazard guidance so that other people don’t go through what she did. One goal laid out in the city’s strategy white paper is the hiring of a chief resilience officer who would harness the new information and coordinate interagency efforts. Following Hurricane Sandy, Congress passed an emergency appropriation of $60 billion, which funded improvements of stormproofing infrastructure. Most of the projects that received Sandy emergency dollars had already been planned and authorized by Congress. That’s how most flood protection infrastructure is funded in the United States. “The vast majority of the funding for coastal risk-related issues is provided only after a disaster occurs, through emergency supplemental appropriations,” notes a July 2014 memo by the National Research Council. Charleston would rather not wait for a catastrophic flood to hit and then ask for money to build protection. “We want to get this [drainage and seawall construction] all put in place so we don’t have any disasters,” says Kirk. 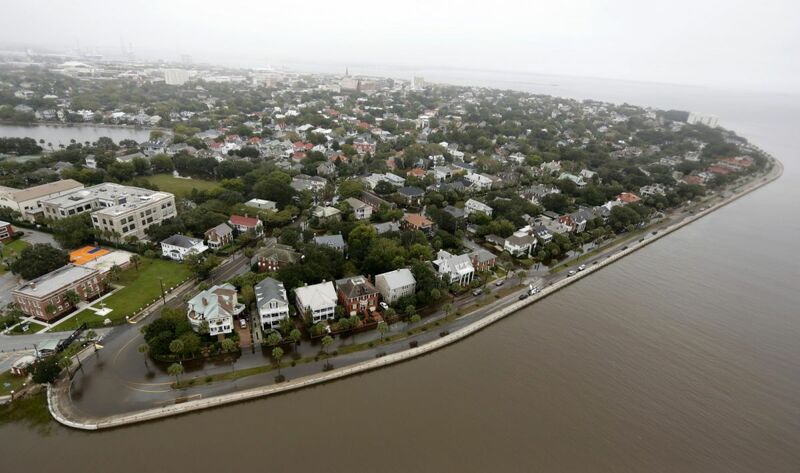 One important lesson from Charleston, Kirk and others say, is that coastal cities should establish their own funding mechanisms so stormwater drainage infrastructure can be strengthened and made ready, before disaster strikes. Meanwhile, Cabiness sees the nation confronting the realities of sea level rise. John H. Tibbetts is a freelance writer based in Charleston, South Carolina. He's written recently for Science, The Washington Post, Planning, and Hakai. For 25 years, he was editor of Coastal Heritage magazine, covering the South Carolina lowcountry.